Brock Griffith Horsemanship is open for business and offers the services listed below. Please call us if you have any questions or are not sure about a service listed. We love doing clinics. Topics can range from ground work, obstacles, trail riding, de-spooking, trailer loading, performance, riding skills and others and are adapted to the skill level of participants. Field horses stay turned out in small groups 24/7. They recirve feed twice daily and roundbales through winter. All horses that are scheduled to arrive on property must have the horse current on vaccines, negative coggins ,and a health certificate. The fee is $50.00/hr, usually it takes 2 hours for a serious evaluation. fee will be $1.00 per mile with a $25.00 minimum. Please note, that all services require a signed agreement prior your bringing your horse on our premises. This is just a standard procedure to protect us from legal claims and to make for a good foundation for our business relationship with you. We offer many other services not listed and will also customize any of the services listed above to fit your needs. We are known to be flexible and try to go out of our way to help our clients with their horses. 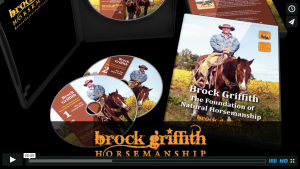 In this 2-Disc DVD Series, Brock Griffith introduces you in a easy to follow way to the basic principles of Natural Horsemanship as he successfully applies it daily.